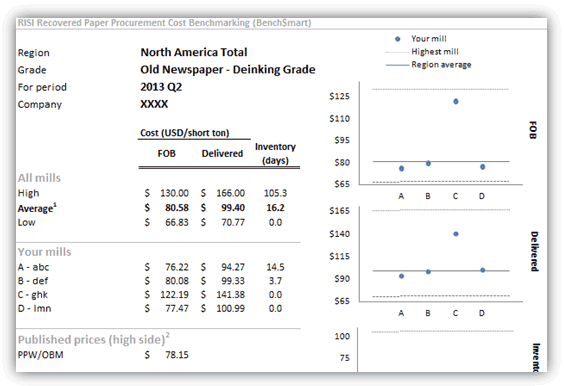 Fastmarkets RISI Recovered Paper Procurement Cost Benchmarking (Bench$mart) - Fastmarkets RISI - Objective Insight. Better Decisions. 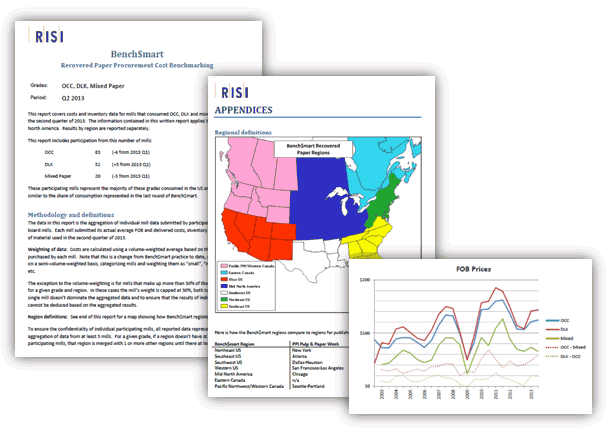 Fastmarkets RISI's Bench$mart Recovered Paper Procurement Cost Benchmarking Service is the most cost-effective management tool in the industry to evaluate your competitive positioning in the market. In the environment of volatile recovered paper prices, increased competition, globalization of supply chains, and the constant pressure to reduce costs and improve asset utilization, it is crucial to understand your mills’ procurement costs compared to the overall market. Quarterly report of actual mill recovered paper procurement costs. Participants submit actual FOB prices, delivered prices and inventories by mill. Report presents volume-weighted average prices and inventory broken out by seven regions in the US and Canada. How effective is your procurement of recovered fiber? Are your freight costs competitive? How do your inventories compare to other mills? In which areas your business might need an improvement? Bench$mart is a quarterly report of actual average mill recovered paper procurement costs collected from participating mills. Only recovered paper-consuming mills are eligible to participate. As a Bench$mart participant, you will receive a report detailing the overall results for each grade, plus a report showing how your mill costs compare to regional averages for each grade. Participants receive data for the grades and regions corresponding to their mills, plus national average data. In addition, reports include an average of published prices in PPI Pulp & Paper Week for comparison. To participate in this project, participants submit the following information for each grade for each mill: purchased volume, average FOB cost, average delivered cost and average inventory level (approx days usage). Fastmarkets RISI supplies a convenient cost data entry Excel sheet to submit the information. Contributed data are screened for accuracy. Any data that seems questionable will be verified with the appropriate participant. Data are aggregated, using volume to create a weighted average. If not enough mills are represented in a given region, data from that region will not be broken out and will instead be combined with other regions so that the identity of any participating mill cannot be deduced. Confidentiality of participant data is absolutely essential. 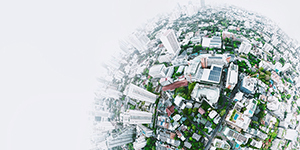 Fastmarkets RISI has been collecting and aggregating confidential company information for more than 20 years, and has a strict protocol for ensuring confidentiality (see Fastmarkets RISI Contributed Data Protection Protocol). Reported data are always aggregated in such a way that it is impossible to deduce whether any company or mill is or is not represented in the data. Because we are reporting actual raw material costs, we have had our benchmarking methodology examined by anti-trust legal counsel. They have found no anti-trust concerns with our methodology. If you have any anti-trust legal concerns we can provide you with further backup from our anti-trust analysis, put you in contact with our legal counsel, and/or consult your own legal advisors. Pricing is based on tonnage of recovered paper purchased. For pricing details, contact us.